The extremely popular Five Silver Dollar Back is the Silver Certificate issue of Series 1886. The front features the head of Ulysses S. Grant, 18th President of the United States from 1869-1873. 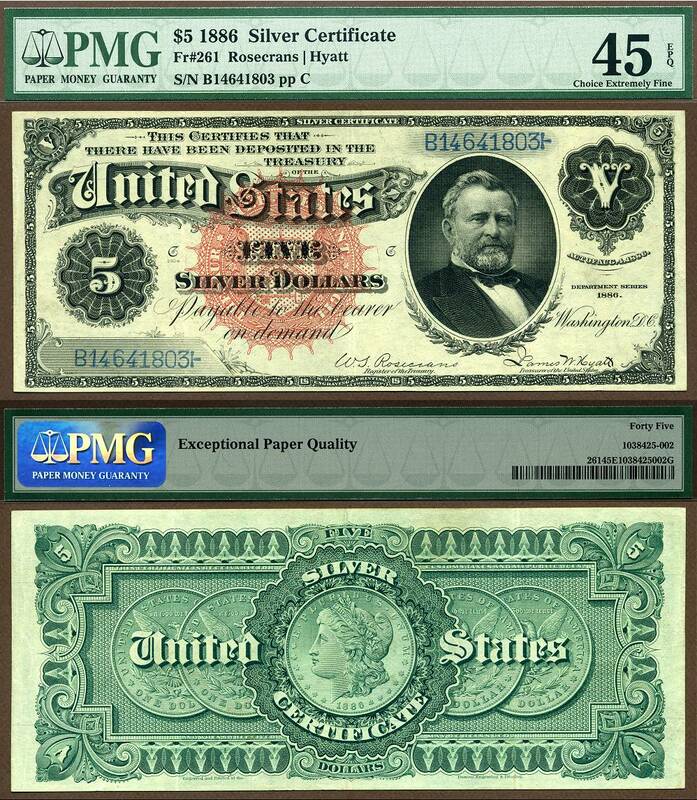 Unlike most notes, where this face is the most important feature, this note gained popularity because of its back design. Five Morgan Silver dollars, dated 1886, fill almost the entire back of the note. They represent the amount of silver coinage for which the bill could be redeemed at the time. Because the reverse of four of the dollars is shown, the phrase “In God We Trust” is seen on US currency for the first time. Not until 1957 was this motto adopted for use on US currency. This series was issued with one of four seal types, Large and small red seals, scalloped and plain, and a large brown seal. This note with a large, red, scalloped seal.